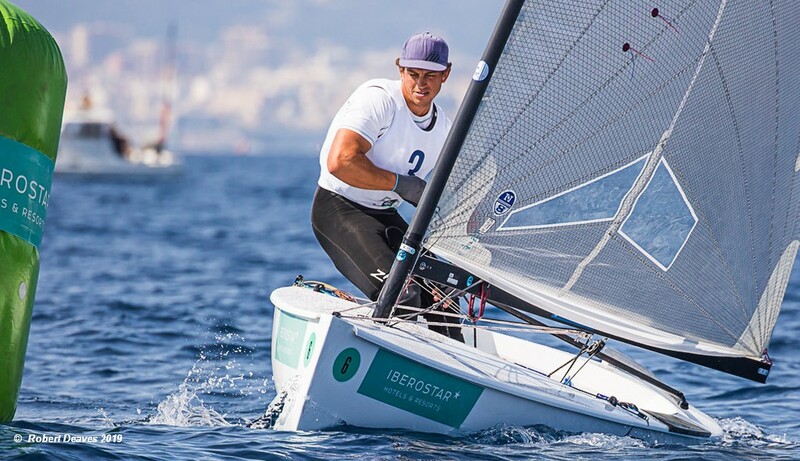 Andy Maloney, from New Zealand has taken a solid lead in the 86 boat Finn fleet 50 Trofeo S.A.R Princesa Sofia IBEROSTAR in Palma, Mallorca after two more races were completed on Tuesday in a light sea breeze. While Maloney won both his group races, Olympic champion Giles Scott, from Britain had a consistent day to move up to second, and Josh Junior, also from New Zealand, and the winner here in 2016, won his second race of the week to move up to third. On the second day of racing, there was a pleasant 8-10 knots onshore, but it got weaker through the afternoon for a challenging final race. The Kiwis certainly seem to have done their homework over the winter, with Maloney and Junior winning their groups in the first race of the day. Maloney won the pin in the second race to again control most of the race to take his third race win of the week to lead the fleet with a perfect score of 3 points. The final win in the blue fleet went to Piotr Kula, from Poland, still hoping to win selection for his second Olympic Games. Coming out of a long period of training and regattas in Australia over the winter, this is the first ‘big’ event for the Olympic champion Scott, since this time last year when he won with a day to spare.